We have many social groups running across Notts, here you can find the most recent list. Our social groups are mixed ability and give you someone to run with. They tend to go out for between 5km or 10km, sometimes both by splitting the group. Feel free to message the group on Facebook and find out what they’re planning, we always welcome new faces. The social groups do not always have a qualified run leader (LIRF). We run beginners groups throughout the year in various locations, you can check here to see what we have coming up. These groups are taken by qualified run leaders who will take the group through the ‘Couch to 5km’ programme in 10 weeks and if you’re up for it you can graduate with the group by completing the nearest parkrun, where you’ll get purple support worthy of an Olympic athlete! If you want to give running a go, trust us, it’s so much easier in a group. The best bit is, it’s totally FREE. We also run improver groups throughout the year, check here to see what’s coming up. 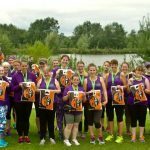 These are aimed at ladies who’ve completed the ‘Couch to 5km’ but would now like to think about running a little bit faster or a little bit further. These sessions are also taken by a qualified run leader (LIRF). 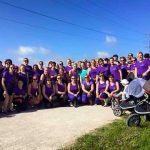 Some ladies just join straight in with one of the social running groups……it’s entirely up to you. Guess what, it’s totally FREE too.